Exceptional students from Petroc’s Mid Devon campus were celebrated at the college’s annual awards ceremony on January 4, 2018. Learners were honoured with 25 awards across five subject areas, reflecting great academic and personal achievement, at the event held at the college’s Tiverton campus. In attendance were friends, families and members of the local community who helped celebrate the students’ successes. Mark Challacombe, Assistant Principal for Mid Devon, said the awards were the highlight of his year. 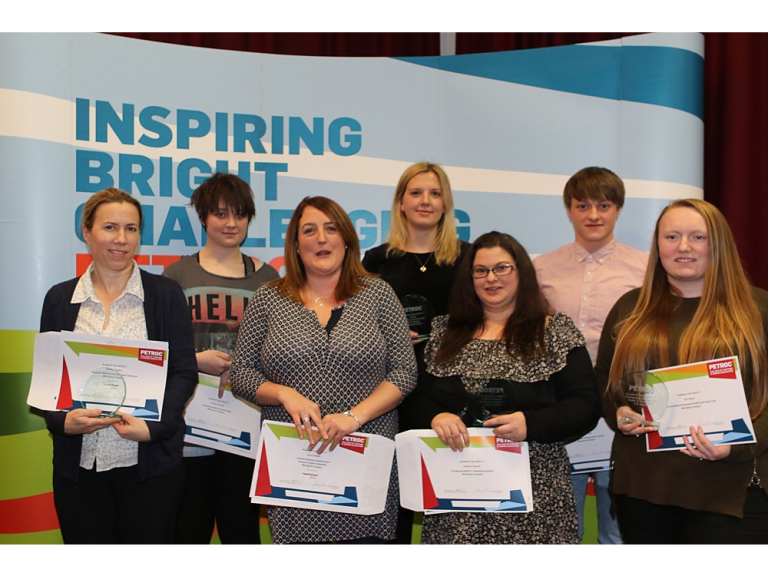 Petroc Principal and Chief Executive, Diane Dimond, extended her congratulations to the award-winning students. “Students at this campus celebrated another year of exceptional results,” she told the audience. “In our vocational courses students achieved a pass rate of 100% and nearly 50% of results were at Distinction-star – the highest possible grade. “During 2016/17 we trained 147 apprentices, we supported students to gain their GCSEs in Maths and English, and we enabled adults to return to study and progress from Access to HE programmes onto degree courses,” she added. Award winners included Chris Pritchard, who won Level 2 Catering Student of the Year and currently works at Michelin-starred The Manor, Lympstone. Gayle Knowles won Exceptional Merit in Access to Higher Education, and has used the course as a springboard to her dream degree – studying Nursing at Plymouth University. Reuben Wheatley won Outstanding Achievement for Supported Learning and has since secured his cohort’s first internship placement at Devon County Council, where he has already received three commendations for his work. Places are still available at Petroc for September 2018. To find out more about studying at our Mid Devon campus, visit www.petroc.ac.uk or attend our next open event on January 23rd.